When Gene Allen died in 2015, of natural causes at 97, the Guild lost the man who was arguably the most influential production designer in the history of our industry. In a long series of important positions, he left his mark on the craft: Oscar-winning production designer, President of the Academy of Motion Picture Arts & Sciences (to date the only below-the-line craftsman to hold that office), Vice-President of the IATSE and head of its West Coast Office (called "the most influential business agent, from any Hollywood IA local, during the twentieth century"), and Executive Director of the Art Directors Guild for an astounding twenty-seven years. A member of the Directors Guild and the Writers Guild as well, he was also a driving force behind the Los Angeles City Film Development Committee, the Hollywood Chamber of Commerce, the California State Theatrical Federation, the Motion Picture Industry Pension Plan, the Motion Picture Country House and Hospital, the Permanent Charities Committee, the Entertainment Industry Blood Bank, and the Hollywood Film Council, most often participating as an officer (usually the chairman) of these organizations. 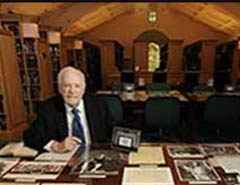 Working with the California state government, he was a key participant in the transition of the Twentieth Century-Fox ranch near Calabasas into its current Malibu Creek State Park status. Eugene "Gene" Allen was born in what was then the Eastlake Park neighborhood of Los Angeles, today known as Lincoln Park, the son of one of the top policemen in the Los Angeles Police Department, W. C. "Butch" Allen. His elder brother, Donald, helped young Gene land some odd jobs on the Warner Bros. lot, including a stint as an extra, circa 1933, in William Wellman's Wild Boys of the Road. His 1937 job as a blueprint boy in the Warner Bros. art department—supervised by Anton Grot during this era—suddenly defined a new ambition: he had always liked to draw pictures, but he now planned to become a sketch artist for the cinema. Among the initial productions in which Mr. Allen was involved were the Adventures of Robin Hood, Juarez, and The Private Lives of Elizabeth and Essex. It was his romance with his future wife of over seventy years, Iris, that again changed his career path, circa 1940. The appeal of steadier paychecks led young Mr. Allen to apply to the Los Angeles Police Academy. He was assigned to the West Los Angeles station mere months prior to the Japanese attack on Pearl Harbor. With sailing a longtime hobby, he enlisted in the United States Navy in 1942 and was assigned, not surprisingly, to the Shore Patrol as a Navy policeman. After the War, he momentously chose not to return to the LAPD, enrolling instead at the Chouinard Institute, Los Angeles' leading art school, where he soon found himself not only a student but an instructor as well. He made application to the studios, and was hired at Twentieth Century-Fox to work directly with art directors such as Maurice Ransford, Chester Gore, George Davis, Joseph Wright, John DeCuir, Sr., and Richard Irvine. During this early 1950s period Mr. Allen had his first contact with the IATSE when he was instrumental in organizing the sketch artists at Twentieth Century-Fox. His role in such organizing became known and his services were rather soon dispensed with by Fox, but Hollywood's sketch artists were finally affiliated and represented within the IATSE. Mr. Allen was soon hired at Warner Bros., the studio that had initially employed him in the 1930s, at the same time director George Cukor fortuitously took up residence there. Impressed with the young sketch artist, Mr. Cukor offered him a knockout promotion: with nary a screen credit, and without serving years of experience in the Warner Bros. bullpen, he was promoted to assistant and then nearly immediately to full art director on A Star Is Born with Judy Garland. The film was nominated in six separate Academy Award categories, and among the nominees was Gene Allen for Best Art Direction, Color, in his debut screen credit. Mr. Allen became Mr. Cukor's acknowledged protégé, the great director's personal heir to the William Cameron Menzies school of deliberate, yet total, production design. Mr. Cukor continued, for more than a decade, as the integral artistic relationship of Mr. Allen’s career. By the close of the 1950s, no art director's settings exuded more of that peculiar sheen which we know as Hollywood's polish. He finally received the coveted Oscar in 1965 for Mr. Cukor’s production of My Fair Lady. When Mr. Allen was asked to assume the duties as business agent of the IATSE Art Directors, he agreed with the proviso that he be given, as he termed it, the powers of a benevolent dictator within the local. Also, that his title be altered from business agent to executive director. These requests accepted, Mr. Allen became the face of the Guild, remaining in this demanding post for a remarkable twenty-seven years. Mr. Allen also had, since his youth, another career, as a pictorial artist. His paintings are on display in galleries and in residences, and to the end of his life his sunny Newport Beach studio was lined with canvases.